I just released version 1.72 of nbody for linux and windows. Mac to follow soon. I have also put up some new runs. Please let me know if there are any issues. some of my 1.72 (not all) say: "computation error"
Message 67832 - Posted: 3 Oct 2018, 11:23:30 UTC - in response to Message 67831. I have the same experience: as of Sep 28 2018 I found more than 150 WU's failing running N-Body Simulation 1.72 (mt). I noticed the same as Jan Henrik above: the failing WU's are all ".._v170_20k__data_.."
There are no failing WU's ".._v172_20k__sim_.."
I did some random check for valid "data" WU's, but did no find any. Too many to check them all. I am running an AMD A10-6800k Win 10 64 Pro build 17763.104 and the N-Body Simulation 1.72 (mt) 4 CPUs, seem to for lack of better definition run away. The first one I let run for 24 hours before aborting, then today I had two more (de_nbody_10-11-2018_v172_20k_data_2_1538704602_247830_0 and de_nbody_10-11-2018_v172_20k_data_1_1538704602_247907_0) which are exhibiting similar symptoms. The symptoms are the Remaining increases at more than double the Elapsed. I currently have them suspended. Message 67847 - Posted: 28 Oct 2018, 1:48:13 UTC - in response to Message 67845. OK with the latest MSFT patches it appears to be functioning again. I am on the insider track at MSFT for Win10 and receive many "updates" before they are ready for prime time. I really dislike devops style of coding. Note the latest patches did not change the OS build number which I can not explain. @PROJECT ADMINS: USERS STILL HAVING PROBLEMS WITH LATEST Nbody release v1.72 BUILD. Message 67926 - Posted: 5 Dec 2018, 10:39:00 UTC - in response to Message 67826. Well, no errors so far, but the mix of (mt) and non-(mt) tasks causes lots of idle time on my CPU, so it would be good if we could choose in the preferences which one we would prefer to use. 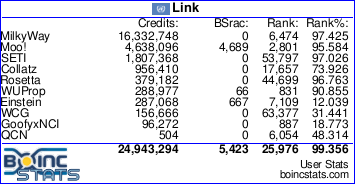 If there's a single core task running, BOINC will even not start another already downloaded single core task unless it's the next one in the list (or I manually suspend all mt tasks between those two).